CNC hydraulic press brake is electric-hydraulic synchronised machine. Top tool can be goose neck, acute or special folding tooling. 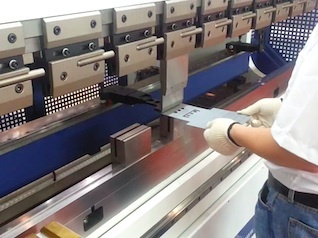 bottom press brake die can be multi-V, Single-V or 2-V type. with advanced synchro method, we can install various hydraulic press tool over length of machine. complexed working piece can be finished on one time tooling setup.